For more than 25 years, Carou Shipyard has been building fiberglass boats. A strategic contract of several boats that had to be delivered to Nicaragua placed the logistics as key to success. In no time at all, KALEIDO, Ideas & Logistics, developed a conceptual solution to transport the boats with a saving of 50% of the total cost and with the highest guaranteed security of the goods. “I was surprised how quickly KALEIDO team responded to the challenge that we launched to transport the boats. But I was even more impressed that their answer already provided a viable solution to address the problem we had with the logistics. Not only it was the best option to ensure the safety of the goods, but also implied a substantial cost reduction that guaranteed the success of the project” explained Juan Carou, CEO of Shipyard Carou. Carou Shipyard sought the advice of KALEIDO on a key project for their company. Initially, the cargo was to be transported in a flat rack, an expensive equipment difficult to procure. 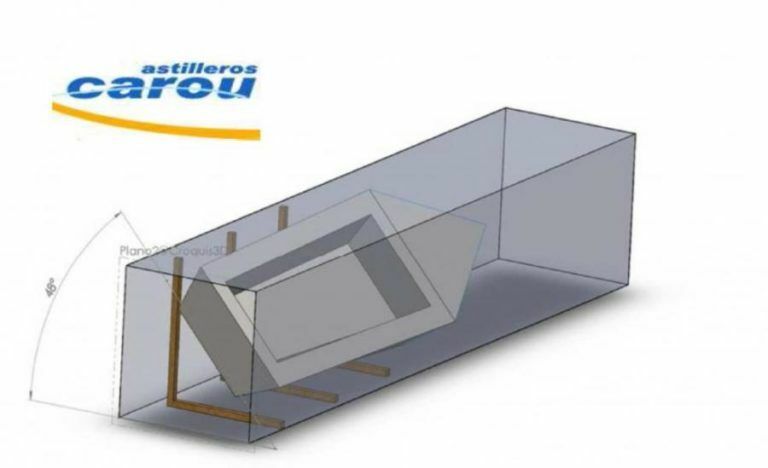 The R&D department of KALEIDO, after analyzing the information provided, developed a conceptual solution in a record time: KALEIDO designed a frame to transport the goods in a dry van container. This solution implies a saving of 50% of the total cost since the dry van is cheaper and the designed frame allows greater capacity. At the same time, it ensures greater protection during transport due to the safety margins applied to the design of structures. The delivery was on time and the boats arrived in perfect condition, confirming and consolidating Shipyard Carou as a company of trust within the naval industry.